Boston Terriers are high energy dogs which means having the right toy is essential for their enjoyment and safety. Bostons are also quite an intelligent ﻿﻿﻿﻿breed﻿﻿﻿﻿ so when shopping for toys you need to combine enjoyment, physical exercise and mental stimulation. Another thing to bear in mind is that Boston Terriers best love games which involves the participation of you, the owner, such as fetch which helps them bond with you. Stuffed toys, chew toys, rubber toys like kongs, squeaky toys are all great Boston Terrier dog toy preferences. 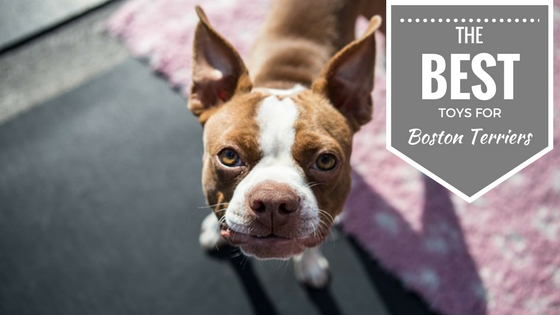 To help you get started, here is a list of the 5 most recommended best toys for Boston Terriers for 2018 & 2019 to help manage their super high energy levels and are safe and 100% fun-guaranteed! These are popular fetch dog balls that will occupy your Boston Terriers for hours and comes with stellar reviews from Amazon. 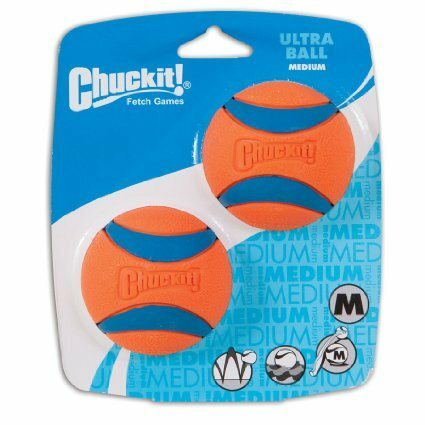 The Chuckit Ultra Ball is durable, highly visible and has both high buoyancy and high bounce. This makes them the best toy for playing fetch game outdoors with your pup. They are available in a number of sizes which makes them especially great for smaller dogs. When you buy this toy, you'll get two balls and if you wish you can keep one for indoor games and the other for outdoor games. Just ensure you have enough room to run around indoors to play. Pair it with the Chuckit Ball Launcher and you'll never touch a dirty ball again! This is another top rated and indestructible toy for your Boston Terrier puppy, adult or senior dog. 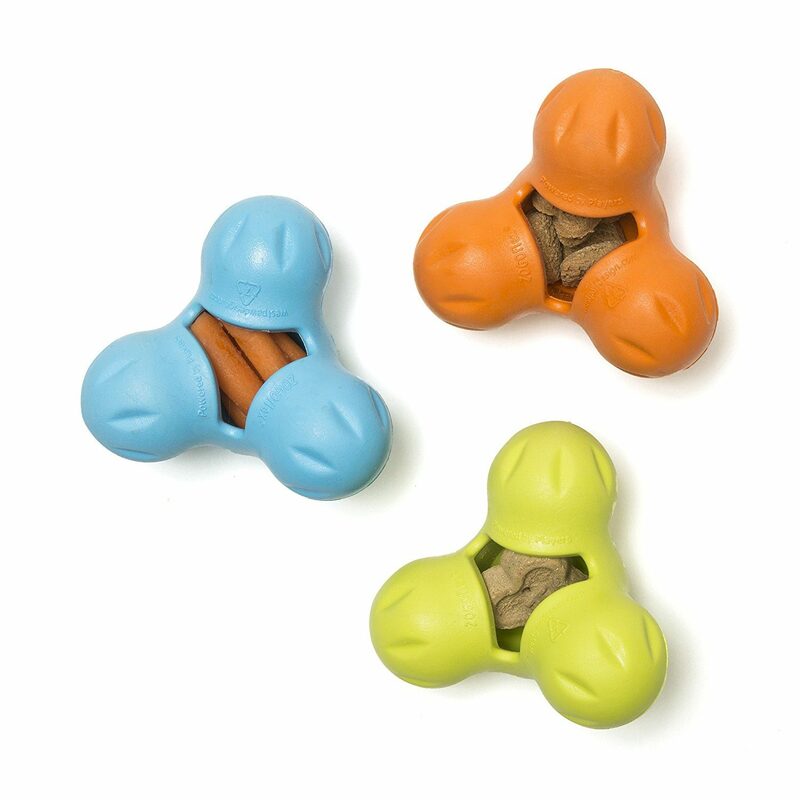 You can also stuff treats or kibble inside this toy, as well as use it to play fetch as it bounces and floats but is also great for chewing. Chew toys as we know helps keep your dog interested for long periods at a time. The Tux from West Paw Design is made with a highly durable material known as Zogoflex. As the Boston loves to chew getting him the best dog toy to chew on is essential and this toy is ideal for their steel-like jaws. The Nylabone is another great toy that will help establish good dental health for your Boston Terrier. 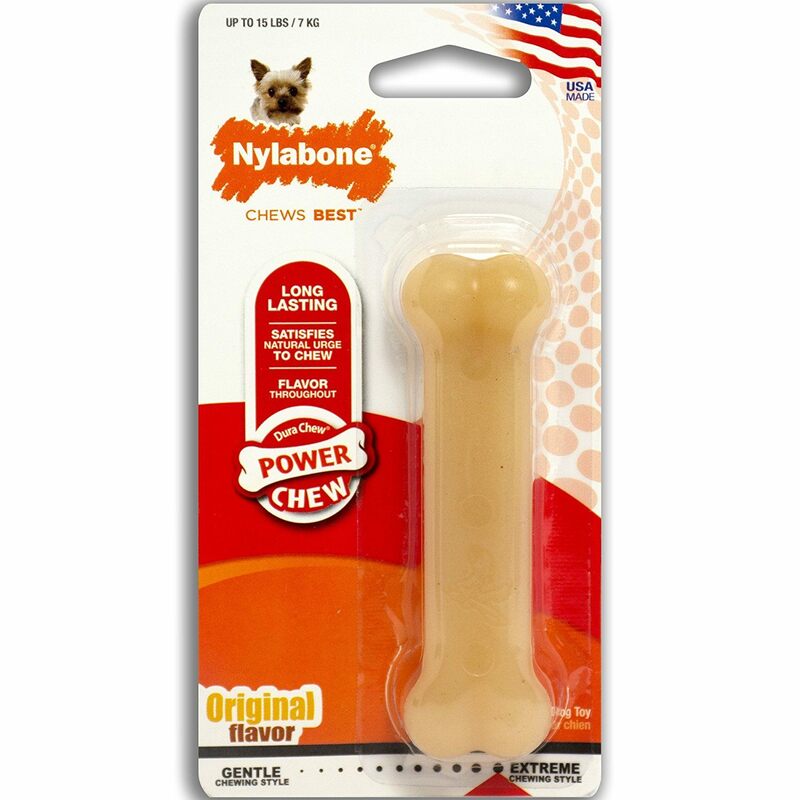 The Nylabone comes with edible and flavored chews that keeps them not only engaged and mentally stimulated but also helps keep their teeth clean. You will have no problem leaving your Boston Terrier home alone with this toy which will keep them engaged for many hours. There are five flavors to choose from and comes in different sizes. 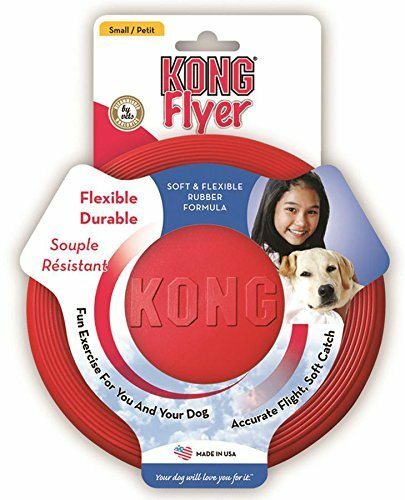 As the Bostons loves playing fetch, this flying disc from Kong is a must-have in your arsenal of dog toys! It's made from rubber so super safe for their gums and teeth and easier to catch on the mouth and more importantly Kong's are known for making long-lasting and durable toys. Number five on my recommended Boston Terriers dog toys list will bring out your dog's natural hunting instinct. This 14'' fox look-alike plush toy is easy to grab and carry, is safe as there is no stuffing for your pup to pull out, has two squeakers - one located in the head and one in the tail. This toy is not easily torn apart and is guaranteed to keep your pup engaged on his own for many hours! What dog toys should you avoid? Despite their small size, Boston Terries are highly-energetic dogs. Because of this, they are likely to destroy delicate toys. What this means is that you should not buy your dog toys made of cheap fabric or any other material that can be easily ripped and torn apart and with fillings which can be toxic. Although the Boston Terriers is a small breed, they LOVE to chew on things. Narrow toys and especially those with smaller edges can easily get lodged in their mouth. It is thus important that you avoid buying such toys. Do you love jogging around your neighborhood every now and then to keep fit? Then you should consider taking your Boston Terrier during these runs (unless you own a dog treadmill). This breed is very athletic in nature and enjoys running around and will definitely be happy jogging alongside you. The key thing to remember here is to ensure that you jog at your pet’s pace and keep an eye out for signs of heat exhaustion as this breed is not very tolerant to extreme cold or hot weather. This is another great game that you can play with your Boston Terrier. Train your dog to catch objects, retrieve objects and follow simple obedience training commands. This will not only get your dog in shape physically but it will also stretch his/her mental capacity. This will provide the mental stimulation so many Boston Terriers need as hiking frequently involves lots of hills and obstacles. The key thing here is to come prepared, so bring a rucksack of supplies of food, water and a safety aid kit. As they are not fans of hot weather go hiking with your dog during cooler weather. An important aspect to owning a dog is to teach them how to ﻿﻿socialize with other dogs. A dog park is a perfect place for that but also provides ample opportunity to let your Boston Terrier play with other dogs for many hours in a safe environment. Extend the life of your toys by not bringing them all out at once. So rotate toys, and bring out only a few at a time and just switch them every couple of weeks. This ensures they won't get bored with them and still remain a novelty to your pup for many years to come! If you have a destructive but lovable Boston in your life it is important to stick to buying highly durable toys. Chew, squeaky, tug or fetch toys are great dog toy ideas as this breed loves toys that involves running around and will increase the bond you share with your Boston Terrier and add much needed fun into your dog’s day.